As the year 2000 neared, we faced repeated predictions of a catastrophic Y2K meltdown in our computerized world. In the end, the new millennium came in like a lamb, computers did not fail, banking systems did not crash, planes did not fall from the sky and life went on. In education today, the hottest topic is 21st century learning. Prescient experts making the rounds on the speakers’ circuit are forecasting an uncertain future and raising anxiety levels. They insist that kids need different skills to cope with jobs not yet invented. Advocates are convinced that the only way to prepare students for the future is by engaging young people in personalized learning infused with technology. I wonder what evidence confirms that familiarity with technologies translates into deeper engagement with learning or advanced critical thinking abilities? The fact that the handheld and wireless digital technologies we access today were all created by the minds of those educated in our 'industrial age' system warrants reflection as well. Nonetheless, continuous improvement, evolution and adaptation are important for all institutions hoping to stay relevant and this includes our schools. Technology will continue to enhance learning experiences but familiarity with apps, downloading music, online gaming, tweeting, updating your Facebook status and two-finger texting are not evidence of creative and critical thinking, intelligent decision-making or superior problem-solving capacities in young people. Most people are attracted to technological tools and marvel at what they can do, but we must be careful not to confuse engagement with our devices with the intellectual engagement associated with deep learning. I am not a troglodyte. I accept that technological advances change how I interact with my world every day, but I challenge the notion that technology in schools will guarantee a better future or improved learning for young people. Social media is a revolution and Facebook alone has more than 800 million subscribers worldwide; however, I believe the potential is limited by the intellectual engagement of the users. Twitter's 140 characters is limited by design and does not inspire, except when messages are linked to better or divergent sources of information. The capacity of my smart phone is very impressive and the applications available are remarkable; however, it has not improved how I do the most important aspects of my job. As a school principal, balancing management with leadership, cultivating a shared vision, nurturing ongoing, stimulating professional development and building the capacity of others requires constant communication and collaboration. Emails, web sites, webinars, online forums, blogs and video links can help, but my work is best accomplished with face-to-face meetings, committees and study groups with colleagues, students and stakeholders who are invested in our school. Relationship building is imbedded in genuinely knowing and trusting the people you work with and sometimes the convenience of electronic communication gets in the way of important personal connections with colleagues. When the Soviets sent Sputnik I into space in October of 1957 the world was startled. A month later, Sputnik II was launched, sending a 1,000-pound payload and a dog into orbit, and western societies panicked. The cry became that our schools needed to focus on math and physical sciences or we would be left behind. Never mind that Russian society was stunted and people lived in fear and often without basic necessities, they had put satellites into space! This Cold War rivalry between the Soviet Union and the West led to a spike in technological advancement never before seen. Unfortunately, governments spent billions of dollars devising sophisticated ways of spying on one another or preparing to kill each other in unfathomable proportions. The good news is that spin-off technologies have mushroomed ever since. In my childhood, we had one black and white television and my parents could not afford cable, so we made do with 3 channels. We had a rotary telephone mounted to the wall, subscribed to the newspaper and long trips in the car meant listening to AM radio and rolling down the window if you were warm. We often played outside and used our imaginations. My children's television has a screen that is 47" wide with a spectacular, high definition digital image and they can access over 120 channels. They both have laptop computers, iPods and smart phones. Long trips in the air conditioned car sometimes includes watching DVD movies or accessing 1000 songs on the MP3. Yet, they too play outside and use their imaginations. Indeed, despite the technological sophistication of their world, they will need the same things I did to be successful in the future: a strong and committed work ethic; the ability to learn and to think, both independently and collaboratively; the ability to communicate; the ability to make decisions; and the capacity to be resilient, flexible and adaptable. And, just like my generation, their lives will be made even richer by having an appreciation for music, art, literature and the outdoors; for having well developed interpersonal skills and making friends; by having a sense of humour and by exploring, embracing and enjoying life. Most of this cannot be learned well in front of a screen. Technology is not a passing fad and it will continue to evolve at exponential rates and this presents a significant challenge for public schools. School systems and governments need to work out how to make technology accessible and affordable for all learners and how to support educators in understanding and integrating technology into their teaching. However, as the latest innovations will emerge at a rate school systems will never keep pace with, crucial literacy, numeracy, critical and creative thinking and problem solving skills will be even more important for students and must remain the focus of good teaching. Technology has changed how we interact with the world and it is important for young people to learn how to use computers and information technologies to enhance their learning and communicate with others. More significantly, they will need a broad knowledge base, a deep understanding of key concepts and a sophisticated repertoire of learning skills to solve the problems of the future. They will need thoughtful, skilled teachers and engaged parents to help them develop the critical thinking skills required to sort through all the noise and misinformation on the World Wide Web. Indeed, it will take a determined, independent thinker to succeed in the face of the constant manipulation and conforming influences of the media inundating their lives. Having been immersed since early childhood, I am confident our youth will continue to adapt to new technologies; however, like never before, they will need to scrutinize information, formulate ideas and think for themselves. I do not think there is an app for that. 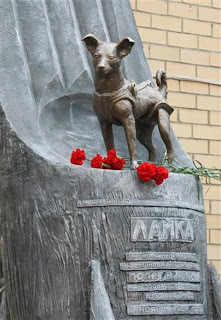 Laika was the name of the first dog and first animal to orbit the earth in Sputnik II. One of three stray dogs considered for the flight, Laika was rounded up off the streets of Moscow, clearly showing how there is hope for all of us as learners. Nicknamed "Muttnik" by the American press, the dog lived during orbit but the Soviets had not yet developed a re-entry plan and she died in space. Laika means "barker" in Russian, making her an ideal fit for my blog. Great post. I agree with your view that technology is a tool, and not more than that. It is not a "cure-all" that will define 21st century learning. While it does make certain parts of information retrieval easier, it does not replace critical or creative thought, play or exploration. As professionals, educators can be swept up in the latest craze; terms like performance-based, criterion-referenced, outcome-based, project-based or even self-regulated and many others are ideas that prove valuable in certain circumstances, but none of them, in and of themselves, are what makes the learning experiences of our students good. Regardless of the strategy or tool, what is required for education to be successful in the 21st century (just like in any other time) is great teachers. It is the appropriate use of the correct tool in the right situation that makes an experience good, and this is only considered by a skilled teacher. Teachers today need to have a plethora of skills at their fingertips, and be able to recognize when to use which one in order to best engage the students in their classes, each of whom will have their own set of experiences, skills and interests. Technology, just like anything else in education, still requires a skilled teacher who helps kids engage in the process by utilizing a variety of methodologies and tools. Thank you for your response Jason. I agree that teachers will always be the most important "agents of change" in our schools. To move learning experiences forward, we need to empower our professional, progressive and thoughtful teachers. They have the credibility and experience that will resonate with other teachers. Change agendas driven by people who are years removed from working in classrooms have difficulty bridging theory with reality. Our role is to build the capacity and audience of these teachers to make 'best practices' grow in our schools. The skills needed to teach the so-called soft skills of critical thinking, creative thinking and problem solving are more complex. As a natural extension of their craft, good teachers will embrace technology. I see a day when we no longer buy textbooks and atlases. Interactive ebooks can be updated easily and pages will come to life. Students should be online and interacting with the world. We need to be careful not to widen the chasm between the teachers using technology and those who are not. Access to technology and ongoing support for teachers needs to improve. Finally, teachers must be included and engaged in the transformations suggested in the BC Ed Plan. We need to sit down and resolve the current labour conflict in our province first. Great post and excellent post comments. I agree with the sentiment that the most important aspect is good teaching. I would rather have a good teacher with no technology than a mediocre teacher with a ton of technology. I do have to say that our children are changing, and we as educators need to change with them. Doing the same things we did twenty years ago may not meet the needs of our children today. That is where technology can play a role. Thank you for the feedback Ashif! Absolutely, exemplary teaching can occur in very basic settings and mediocre teaching can happen alongside the latest in technological sophistication. Good teachers will look for ways to integrate technology to enhance learning experiences for their students. We must look for ways to make technology accessible to all learners (and educators) and constant updates, maintenance and cost will make this a considerable challenge.